I guess I should clarify a couple of things about that headline: ‘coolest’ is entirely subjective, of course, and chances are really, really good that you can’t actually buy it, since only a very small percentage of our readership is in any country where it’s actually sold. 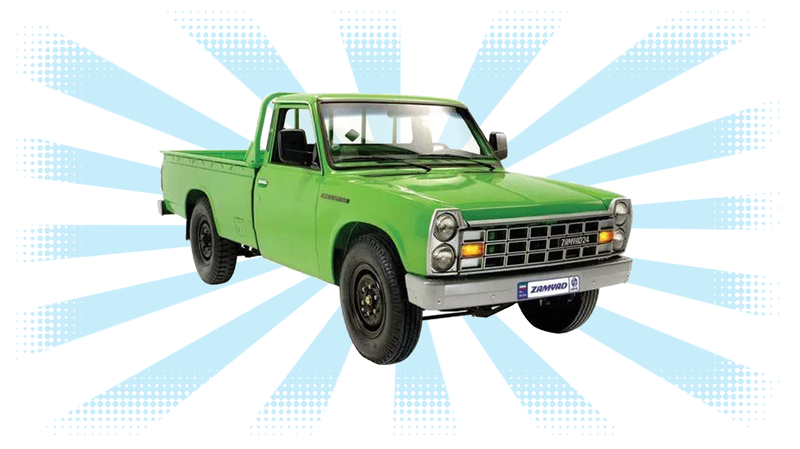 Even so, I’m pretty smitten with the Zamyad Z24 pickup truck. The Zamyad Z24 is pretty much exactly the sort of new pickup truck I’d love to buy, but is all but extinct in America: small but with a big enough bed to be useful, rugged, simple, utilitarian, but with some real character. You might think that the design of this new-in-2017 truck is deliberately retro-looking, but that’s not exactly right; it’s not retro, it’s just simply old, because the Z24 is basically a 1970 Nissan 140-Series Junior pickup truck, but with a somewhat more modern Nissan Z-series engine. At 47 years old, this truck has to be one of the oldest platforms you can buy new today. But why change something that works so well? Look at this little brute: the front end styling feels almost ‘60s or ‘70s American, with the big grille and the stacked headlights, it’s got all those handy tie-down hooks along the upper edge of the bed, and I think there’s even a bench seat inside. That Nissan-derived engine is a fuel-injected 2389cc inline four, mounted longitudinally, and pumping the raw power of 95 horses to those rear wheels. It’ll carry over 5000 lbs of payload, and gets a respectable 19 MPG. There’s also a 2800cc diesel option and a 2400cc CNG version as well. I even forget about what a deathtrap it probably is when I look at it—it’s just a fantastic-looking little truck. Besides, part of being cool is danger, right? What’s more dangerous than early 1970s safety standards? A cement mixer! A tow truck! Both a fire truck and an ice truck? Amazing. The Z24 is pretty affordable, too. It looks like it sells for, in American dollars, somewhere between $8,530 and $9,350. I suppose our economic sanctions with Iran are also going to be a factor for why Ford and Toyota won’t be losing any sleep about the threat of archaic Iranian pickup trucks taking away their business anytime soon. If relations with Iran eventually warm up, though, I think Zamyad company should give some serious thought to getting this thing up to current U.S. standards while keeping the design as intact as possible. Which I realize is pretty much impossible. This thing would sell like hotcakes here! Well, maybe the hypothetical, unrealistic, and improbable hotcakes I tend to enjoy. Whatever. It’s still a cool little truck.